This report provides a unique perspective on claim abuse among auto injury claims closed with payment. Using data from the 2012 closed claim data collection, it describes the prevalence of fraud and buildup among the five main private passenger coverages and includes analysis of different types of abuse, estimates of the excess payments attributable to fraud and buildup, variations by state. It also examines the differences in claiming behavior between claims with the appearance of abuse and other claims and provides information about some of the fraud-fighting tools used by insurers. This report updates previous IRC studies surveying the public about the acceptability and perceived frequency of various types of insurance fraud, with special emphasis on auto insurance fraud. It also examines attitudes toward a variety of tools that insurers and law enforcement use to fight against insurance fraud, including claim handling techniques and consequences for fraudulent behavior, and the public’s willingness to perform fraud-fighting efforts. The study finds lower tolerance of fraud than in past studies and broad support for measures designed to reduce fraud. This IRC study examines regional differences in New York’s auto injury claims using data from 2002 and prior years. The study shows several aspects of claiming behavior in which New York City area claimants were different from upstate claimants, including frequencies of the presence of fraud and buildup indicators. As part of the IRC’s 2002 auto injury study, file reviewers assessed claims for the presence of indicators of fraud and buildup. This report examines the prevalence of these indicators among California auto injury claims compared to national patterns. Also, fraud and buildup patterns in Los Angeles are compared to those found in the rest of the state. The Insurance Research Council (IRC) estimates in a new report that fraud and buildup added between $4.3 and $5.8 billion to auto injury settlements in 2002, which represents between 11 and 15 percent of all dollars paid for private passenger auto injury insurance claims in that year. This estimate is somewhat lower than in an IRC study of claims paid in 1992. 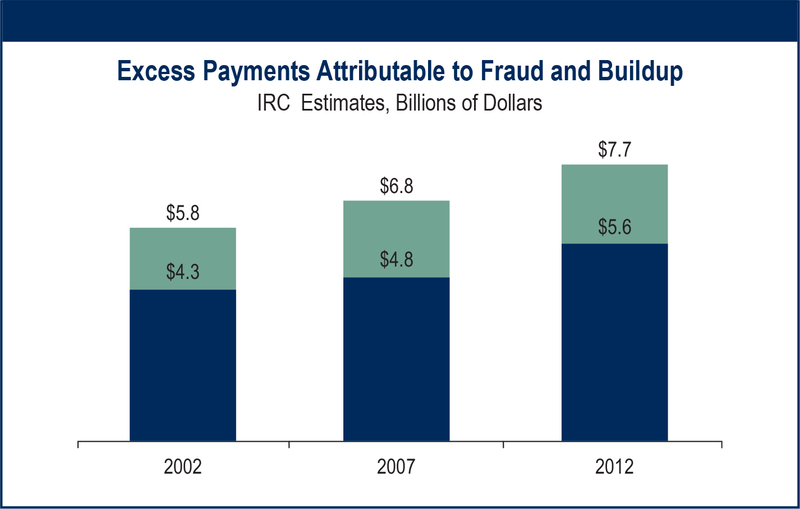 In the previous study, the IRC found that fraud and buildup added between 17 and 20 percent of total claim dollars paid in 1992. According to a new study released by the Insurance Research Council (IRC), respondents residing in New York State were more likely than respondents nationwide to agree that it is acceptable to increase an insurance claim by a small amount to make up for insurance premiums paid when no claims were made (25 percent among respondents in New York versus 20 percent among respondents countrywide). They were also slightly more likely to say it is acceptable to increase a claim for the deductible that would have otherwise been paid (32 percent versus 29 percent). Written in collaboration with Insurance Services Office, Inc. (ISO), the report analyzes survey responses from 353 large, medium, and small insurance companies that represent 73 percent of the property-casualty market for 1999. Findings show how insurers perceive the problem of fraud and the corporate resources and strategies their companies are using to fight it. This study systematically examines fraud and buildup in private passenger auto insurance claims in the United States. The findings are based on approximately 12,000 bodily injury liability claims and 3,000 no-fault personal injury protection claims closed during the Spring and Summer of 1992 in Arizona, California, Connecticut, Illinois, Michigan, Missouri, New York, South Carolina and Texas.